'Computer for Every Child' government program gives underprivileged children new educational opportunities. 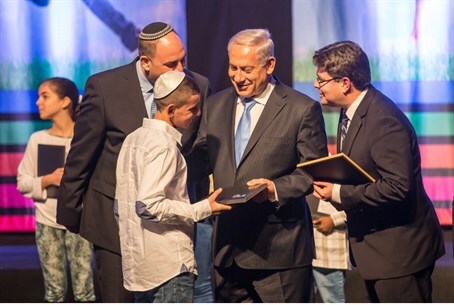 Prime Minister Binyamin Netanyahu (Likud) and Deputy Minister Ofir Akunis (Jewish Home) presented tablet computers to 94 underprivileged children in Lod Thursday, as part of a government initiative to provide educational opportunities for children suffering from the socioeconomic gap. In the past year, under Deputy Minister Akunis's leadership, the project has been upgraded from "Computer for Every Child" to "Tablet for Every Child" in order to place the initiative at the forefront of technology and provide children with more innovative and sophisticated tools. At the ceremony, Netanyahu stated that the initiative is part of the government's wide-ranging plans to close all sorts of gaps: educational, geographical, socioeconomic, and more. "We are canceling the periphery," he stated. "You may notice that you are traveling on the country's highways and are seeing major works: Highways, railways, interchanges and bridges. We are linking south and north and are also laying fiber optic cables from Kiryat Shemona to Eilat in order to cancel the geographic and social peripheries." Akunis added, "This evening we are doing an act of true social justice. We do not suffice with words, slogans and clichés. We are simply doing. There are no equal and less equal and all Israeli children deserve equal opportunities. Reducing the digital gap means reducing the social gap." Israel is widely considered as one of the leading technology powerhouses in the world, and has received great international support. Just this week it was reported that American television legend Larry King is joining up with the Technion in Haifa to establish the Israel Silicon Valley Chambers of Commerce, to further boost Israel's hi-tech industry.